Due to some weather conditions during winter months some activities may not be available. Please call to reserve. 800-293-5444. Please note that many of the RESORT ACTIVITIES at Zion Ponderosa are staffed and operated by East Zion Adventures, a DBA for High Country Leason, LC. Zion Ponderosa guests participating in these activities will be required to sign a separate waiver and release form prior to participation. Half Day – 4 Hrs. Explore southern Utah’s dramatic back-country with an expert guide. Reservations highly recommended. A good experience for participants of all ages. Bring a hat, sunscreen, and appropriate clothing for season. Advance reservations recommended. Download and print for reference. Half Day – 4-6 Hrs. Full Day – 6-8 Hrs. Explore stunning canyons that have been carved by water and wind. Advance reservations highly recommended. Maximum 250 lb. weight limit. Best for ages 12 & up. Picnic lunch included. Advance reservations recommended. Get to know Zion National Park the locals’ way. Experience some of Zion’s best-kept secrets; secret slot canyon, majestic overlooks, or swim in natural pools. Advance reservations recommended. Good for physically active guests of all ages. Advance reservations recommended. 1, 1.5, and 2 Hour rides. Experience the feel of the wild west, and the open spaces, forests, and overlooks of our 4,000 acre ranch. Riders MUST be at least 4′ tall and under 220 lb. Explore the Ponderosa trails in solitude, on one of our mountain bikes or fat tire bikes. A map of available roads and trails is provided. Ability to ride on diverse terrain, roads, and trails. Remember that you are at 6,500′ elevation. Whether you want to get some practice before climbing the Zion red rocks, have a friendly competition against your family members, or simply get a good upper body work out, our rock wall is right for you. 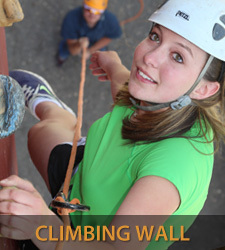 We have beginner and intermediate routes good for all ages. Get a true taste of the old west as you enjoy a wagon ride on back-country roads, and through the forest, and then return for a delectable western feast. No specific requirements other than, come hungry. For your convenience, we are offering you the opportunity to rent a golf cart! Each of our golf carts seats 4 people. You must be 16 years of age to operate these vehicles. 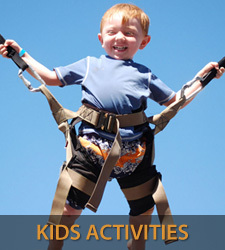 Enjoy our Bungee Trampoline, Mini ATV’s, or Pony Rides. Young kids really enjoy these activities, and you’ll capture some smiling faces with your camera. Click book now button to view size, age, and weight restrictions for each activity. Our trained, certified Kids Camp counselors will take care of your children so that you can spend the day playing in the outdoors. While you are adventuring, your little ones will be learning and enjoying activities. Full day kids camp goes from 8 am to 4 pm. Kids Camp is for children between the ages of 3 and 11. Children must be potty trained. Lunch and snacks are provided. Our deluxe miniature golf course is artfully designed to contour with the terrain and offers several water features. Challenge friends and family of all ages to a friendly competition. 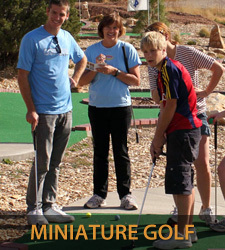 This is a self-guided activity and the miniature golf course is open through the day and into the early evening. Show your friends and family some tough love with a good splat! 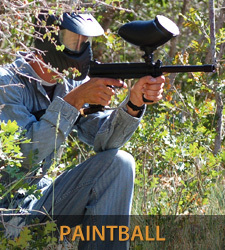 Each paintball game includes 200 rounds of paintballs per gun, a jumpsuit, and mask. Additional rounds of 500 balls may be purchased during your game for $20. Test your aim with one of our 20 gauge, pump action shotguns! Our trained guide will throw each target on your command: just pull, aim, and fire! 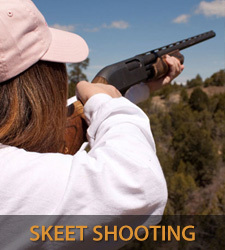 Each shooter receives a specific number of rounds of ammo and clay pigeons. Additional rounds may be purchased. Experience the peace and serenity of our forested plateau above Zion National Park, and gain balance, strength, flexibility and power, in a shared Yoga fitness course. Must be reserved in advance. Available during certain seasons. Contact us for details. Take the plunge off our 100 foot building and soar through the air! This is great for the young and the young at heart. Some weight restrictions. Enjoyable for ages six and up. Please Note: Most recreation activities are weather-dependant and, therefore, may not be available during wet time-frames and/or cold months. This includes ATV tours, horseback rides, Jeep tours, and paintball. Canyoneering is available from March to November each year – weather permitting. Reservations / Cancellations: We do encourage you to make a reservation in order to guarantee space for you and your group on Zion Ponderosa recreation adventures. Please note that by reserving your space we have turned away other clients and this cancellation policy protects the resort from monetary loss. Cancellations of reservations within 48 hours of trip departure are non-refundable. We WILL refund or reschedule if weather conditions prohibit participation in your scheduled activity. Click the link to use our online recreation reservation request form. Staff Lunch Break: During spring and fall our recreation staff take a lunch break from 12:00 noon to 1:00 p.m. Guided activities are not available during this time frame. ** Zion Ponderosa Resort is an exclusive outdoor recreational facility. Weather conditions are monitored daily. Due to inclement weather some adventure activities may be changed or canceled.